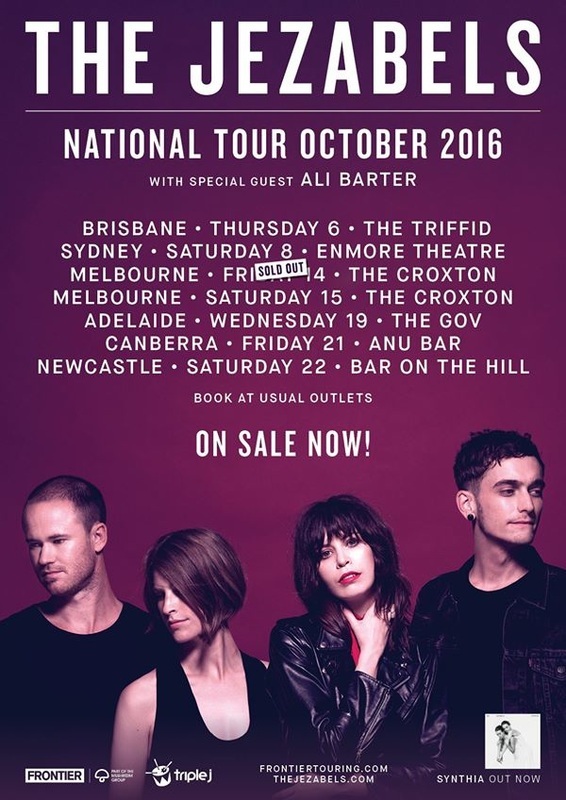 ​One of Australia’s finest bands, The Jezabels, are pleased to announce their long-awaited national album tour. The four-piece will return to stages across the country this October, following on from the success of their stunning third album Synthia, released in February 2016 and hailed as their finest effort yet. The October dates are a welcome return for the My Love Is My Disease, Pleasure Drive and Come Alive four-piece, who were forced to cancel a tour six months ago for keyboardist Heather Shannon to continue her treatment for ovarian cancer. The band is thrilled that Heather’s health is back in check, and are truly psyched and ready to hit the road once again, performing favourites from earlier albums Prisoner (2011) and The Brink (2014) and now Synthia! ‘We are so thrilled to be announcing this new tour after the heartbreak of cancelling our tour earlier this year. Heather is feeling strong again after her treatment and we are all impassioned and eager to finally give Synthia the tour she deserves. We were so touched by the outpouring of support toward us over the course of this year, we cannot think of any better way to show our gratitude than bringing Synthia out on the road. We cannot wait to introduce her to you all, to see your beautiful faces and to celebrate the end of this unique and challenging year. Written and recorded with long-time producer Lachlan Mitchell, Synthia debuted at number four on the ARIA Album charts in February 2016. Australia first fell in love with the band in 2009, when their debut EPs - The Man Is Dead, She’s So Hard and Dark Storm - began their slow burn. Prisoner went on to scoop the Australian Music Prize and set stages ablaze from Splendour in the Grass to Lollapalooza; The Brink and the global onslaught that followed included talked-about live performance slots at Montreal Jazz Festival, Glastonbury, T in The Park, Deichbrand and more. Joining The Jezabels on the road will be Melbourne’s Ali Barter, who’s been all over triple j airwaves with tracks like Far Away and Hypercolour. The classically trained singer/songwriter has played shows with everyone from The Rubens, The War On Drugs, Cloud Control and Phosphorescent, as well as a slot on 2016’s St Jerome’s Laneway Festival. With a brand new label deal inked with Inertia Music, Ali is currently recording her debut album.